It’s easy to live in Provence and think you know a little about its culture. Pseudo-intellectual conversations about the wine, the food, and the slow pace of life are common around the expat dinner table. Then there are the visual treats, that unrivalled light that artists and photographers can’t get enough of or a village displaying its full market day plumage. Unnoticed amid these everyday glories are flashes of blue, gold and orange. Here a tracksuit, there a car sticker, a boy wearing a pair of shorts emblazoned with a golden star. Listen to the radio and amid the announcements of fetes and feast days, there is a daily mention of the fortunes of Olympique Marseille. It has always amazed me that our local hypermarket, over one hours drive from Marseille, could sustain a merchandise and ticketing shop for the club. That’s like Chelsea opening an outlet in Sainsbury’s in Sevenoaks. Knowing that OM resides closer to my neighbour’s heart than the ubiquitous packet of cigarettes in his breast pocket we occasionally talk football. The other day he told me he had a spare ticket to an OM game. ‘What time shall we meet?’ I asked. The rendez vous was at a brasserie. The pre-football match experience I was used to from my youth was a stroll down a freezing dark road, with the contents of a soggy meat pie burning my fingers. An OM game would be different I reasoned. We’d relax in the late summer Mediterranean heat, sip slowly on a local white, eat some seafood, switch to a heavy pungent red, finish off the cheese and head to the match. My neighbour was after all a cultured man, a gourmand and a producer of his own fine peppery olive oil. I was right about the heat, it was a warm clear evening, and wrong about everything else. Marseille were playing Arsenal in the Champions League in the biggest game of the season to date, and in an effort to cope with demand the brasserie had severely edited its usually extensive menu. There were just two items on offer: pastis by the pint and a ham baguette. Both in hand I joined my neighbour at a table with some supporters. The table looked at me as if I was stupid. Had I not heard that Adrien Anigo the son of the famous Marseille football director Jose Anigo had been shot dead the other day. According to the police it was a gangland shooting connected with drugs. ‘It’s not really fair though, Marseille counts its suburbs in the crime stats, whereas other cities only publish for the centre.’ The tone used was how one might discuss the coach favouring one striker over another. ‘So it’s not that bad.’ I said to reassure myself. ‘The island has the highest murder rate per capita in France’ my neighbour explained. The conversation turned to football. Arsenal it was agreed would probably win. The club benefited from the revenues of its massive new stadium and well organised marketing and merchandising division. 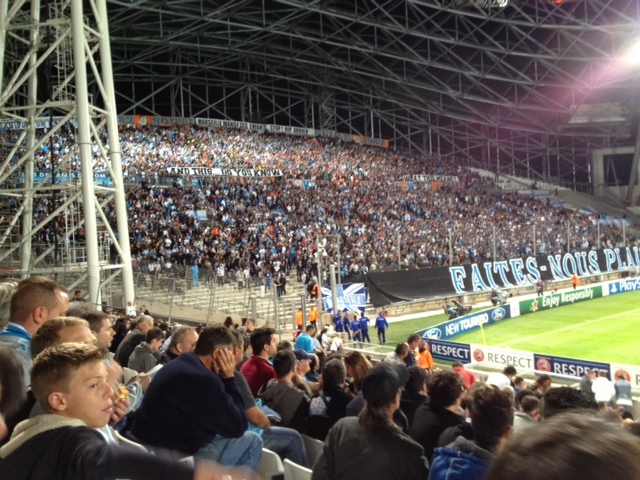 Marseille on the other hand had a stadium that was a building site and a port through which a new container load of fake merchandise arrived every day. We ordered another pint of pastis each. The street lights came on and the evening became hazy. In the back of my mind I was still worried by the murder stats. My only previous experience of violence at a football club had been as a teenage supporter of Crystal Palace. Wearing a long scarf knitted by my Nan which made me look like the incumbent Doctor Who of the time, I’d been kicked in the back of the knee by a passing Millwall fan. There had not been as much as a hello, or even any eye contact, just a small act of gratuitous violence that had made me hobble for the rest of the week. ‘Will there be any trouble?’ I asked. He went on to explain that OM had an unusual way of allocating its tickets. 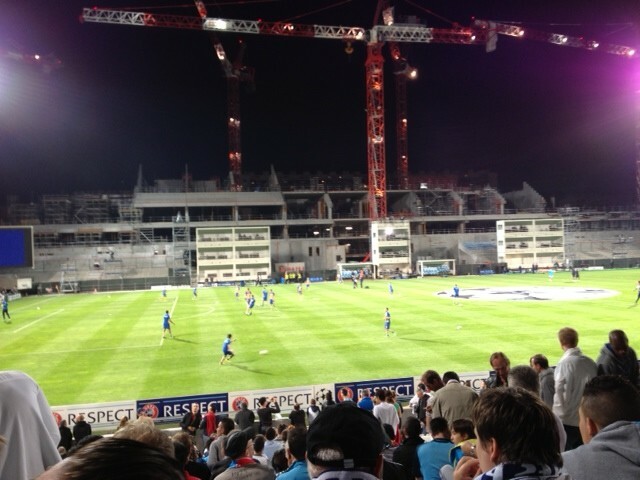 The stands behind both goals were given over to the supporters clubs. There were about 7 different clubs of varying size engaged in a constant battle to take over more of the stand. Their purchasing power at the beginning of each season, was determined by the number of members. Unsurprisingly relationships between the various supporters clubs were not good. The larger clubs such as the Commandoultras have a decidedly militaristic feel to them, with motos such as ‘alone against everyone, one myth, one time, one fight’ and motifs including a skeleton wearing a Marseille hat and Freddy Kruger. ‘What about songs’ I asked trying to lighten the mood.